Physicsforms.com Admin reply to my query about the disappeared Unit-3 thread: The thread has been placed in moderation pending cleanup, i.e., removal of misinformation and nonsense, which goes back nearly two weeks. My Reply to Admin: So physicsforums is not a place to discuss, debate and debunk. Did you see the last comment to that thread? Someone thanked me and others for showing why some conspiracy nonsense posted was bunk. Yet censorship ironically implies that the nonsense can't be debunked. Physicsforums.org just removed the long thread on the Unit 3 explosion, which was a stellar example of group analysis that had, over months of discourse and debate, generally converged on a steam explosion. This by itself is a very big topic and needs to be separated from that missive that is the main Fuku thread. I also know that this will lead to speculation, but there is already a boatload of speculation in the main thread. When we are not getting totally accurate information, we are left to speculate. Now, I know that we probably will not know for many years, but based upon the best information available there are a lot of theories out there. Arnie Gunderson says it was a prompt Critical Explosion in the Spent Fuel Pool of Reactor Three, but I thought I saw the fuel assemblies still in place in a brief video of the fuel pool. I would think that an explosion would shoot all of the contents into the air and leave rods all over the place. Rods are long and circular and I do not see that in the photos taken post explosion. I do see thin long sheets of something that is metalic, but do not know what they are other than some sort of construction material. The Japanese say it was just a Big Hydrogen explosion. Well, I think the first part of the explosion that went out horizontally was a hydrogen explosion, but then something else happened and there was another massive forceful explosion upwards. If I have the reactor in the right place then the explosion came from alongside the Reactor Vessel, possibly from the Wet Well. Now, I know that the majority of the guys posting here have their own theories. Could you state what evidence you are using for your theory? Photos would help. Jun10-11, 10:22 AM Last edited by zapperzero; Jun10-11 at 10:47 AM..
Let's see if this thread takes off :D.
My theory is this: radiolysis created a lot of Hydrogen and Oxygen from the steam bubbles that were being produced in the SFP. Boom. I found this paper that says hydrogen production in water vapor is about 8 molecules per 100 eV (alpha only). It also says a number of other interesting things. From J.W.T. Spinks and R.J. Wood, An Introduction to Radiation Chemistry (Third Edition), John Wiley and Sons, Inc. 1990pp. 260 . Note that there is a typo in the Table 7.4, where mol/J should have been micro mol/J. - Hydrogen generation rate 0.047x1.0E-06 (mol/J)x2(g-H2/mol)x5(J/s?kg)x2.0E+6(kg) = 1(g-H2/s) approx. - Solubility of hydrogen gas in water 0.014 g-H2/kg-water. - Amount of dissolved hydrogen at 40C =0.014 (g-H2/kg-water)x2.0E+06 (kg) = 38kg. - Time necessary for DH to reach the saturation limit =38,000 (g-H2)/1(g/s)=38,000 (s). Therefore the pool water can be saturated with hydrogen due to water radiolysis in a matter of ten days in this approach. The simplified radiolysis calculation using only G(H2) can be high or low by factors, comparing with a more detailed calculation by solving the first and second order reaction rate equations in combination with g(e-aq), g(H2O2), g(H2)m g(OH), g(H2), g(HO2/O2), by using a full set of radiolysis data such as provided by Dr. A.J. Elliot (153-127160-450-001 Revision 0). However, the difference will only affect the time to reach the saturation levels in DH before the accident, and will not seriously affect the whole scenario. When the pool water temperature came near the boiling point, practically all this dissolved hydrogen (DH) gas should be released into the Spent Fuel Pool room. I believe this should be the root cause of hydrogen explosion at the spent fuel pit area." I do not know what to make of it. It's supposed to be an e-mail from a mr. Genn Saji, a former secretary of the NSC, part of a series. Maybe it is legit. Maybe we should invite this person here, although he seems kind of busy :D.
it appears that is more or less exactly what happened. Are you saying you agree with Gunderson? If so, why are the spent fuel rods still in the spent fuel rod pool at Reactor Three? That is based upon the underwater video that only gives a brief glimpse of the top of the assembled modules. If there really was a Prompt Critical Explosion, the contents of the pool should have been shot up like a shotgun blast thousands of feet into the sky. The fact that they are still sitting there says it did not happen and the tremendous focused force of the blast had to come from another source. 1 The solubility of hydrogen in water drops rapidly as the water heats up. So by the time the water was close to boiling, there would be no hydrogen left to come out. 2 The scale of the explosion seems to me way more than could be achieved by 48kg of hydrogen. There is a TEPCO analysis which speaks of 800kg of hydrogen produced by radiolysis inside the reactor vessel, this seems a much more quantity to me. That said, the source of the hydrogen is still undetermined, as best one can tell. I have followed up on the potential for radiolysis and believe it is a plausible explanation for the Unit 4 explosion and damage. I am still looking at the possible scenario of Hydrogen gas from unit 3 through the SBGT system ducting. I calculated decay heat for Unit 4 based on a full core offload 102 days before 3/11/2011 using rated thermal power of 2381 MWt and three batches of spent fuel aged 1 year (204 bundles), 2 years (204 bundles) and 3 years (171 bundles). I used the methodology of ANSI/ANS-5.1-1979. This calculation estimated decay heat in the Unit 4 SFP as 3.05 MW. Using the various plant drawings posted on the forum I estimated spent fuel pool water volume of 1170 m^3 or 1.17E6 kg. Assuming adiabatic heating and an initial temperature of 25 degC at the time of Loss of Spent Fuel Pool Cooling (15:45 3/11/2011) the estimated time to boiling was 33.5 hours or 3/13/2011 13:12 hr. Using the ORIGEN2 analysis I have referenced before and the same core/batch assumptions used in #1 above I estimated total ionizing radiation in the spent fuel pool as 6.18E24 eV/sec. I determined that alpha and neutrons interactions are several orders of magnitude less than Beta and Gamma so these were ignored. The total used includes Bremsstrahlung radiation and x-rays. Then assuming a production rate of 44 molecules of H2 per 1E4 eV of radiation from the Hydrogen Manual AntonL has referenced, I come up with a production rate of .0903 g of H2/sec. The method used in the Hydrogen Manual indicated it was probably a significant over-estimate of hydrogen generation and this calculation is about one tenth of that estimate. One note in the calculation used by AntonL is that the rates in the table he used are average rates over the entire production time, and need to be converted to instantaneous production reates which will also lower the production rate. I assumed that once pool boiling starts the H2 gas will be released from the pool at the production rate. TEPCO does not know exactly when the damage to Unit 4 occurred, but damage was observed about 3/15/2011 at 06:00. This gives a maximum duration of boiling and hydrogen production. Again using the calculated decay heat rate and latent heat of vaporization of water I calculated a boil-off rate of 1.35 kg/sec from the pool. It would have taken until 3/18/2011 to boil off half the pool volume. Therefore there was no fuel uncovered. Using the discovery time of the Unit 4 building damage, a maximum of 16.9% of the pool volume could have boiled off. In this same time a maximum hydrogen production of 13.25 kg was possible. If we ignore steaming rate and other contributions that could have caused dilution of hydrogen in the refueling floor, a simple linear first order differential equation model would result in a LEL of Hydrogen (4% by volume) in about 15.8 hr or 3/14/2011 05:00. By the time damage was discovered the concentration could have been as high as 65%. This ignores significant dilution due to approximately 20 m^3 of steam entering the refueling floor every second. That steam could have explained why the blowout panels were open on Unit 4 since they would relieve at a low (inches of water) pressure. There was no ventilation assumed due to lass of power, however there could have been some airflow through the blowout panels due to steaming, condensation and buoyancy driven flow. Assuming that all of the generated hydrogen remained in the building, I used an spreadsheet (Estimating Pressure Increase and Explosive Energy Release Associated with Explosions, Version 1805.0), from the NRC website to estimate the explosive power of the hydrogen. This spreadsheet calculated an equivalent TNT weight of 385 kg. Using the perimeter of damage calculation method from US NRC RG 1.91 the radius for overpressure of 1 psi where structural damage could occur is about 130 m.
The intent of these calculations was to determine if the times and sources of heat and radiation would permit explosive concentrations of hydrogen to exist with only radiolysis and fuel pool boiling. More detailed modeling of the interplay between air flow, steam, and hydrogen or use of thermal-hydraulic analysis codes could refine this picture. , but as of now it looks like this scenario is plausible. Thanks AntonL. 1. Yes. Only this makes further production through radiolysis more efficient not less, as with every reaction, if you imbalance it... Also production from steam is more efficient than production from water, because the self-shielding effect is not there. An interesting aside, which no-one seems to mention: when boron absorbs a neutron, it produces alpha particles. The alpha particles radiolyse more water. There was boron in the SFP water, I believe. 2. 48kg seems conservative, yes. If Gunderson "thinks" ( term used loosely ) that that was a prompt critical explosion; then he doesn't know beans. It was a hydrogen explosion. Some hydrogen was released radiolytic decomposition. However, the bulk of the hydrogen was released by zirconium oxidation. When the temperature gets high enough, zirconium in the presence of water will oxidize. Since the zirconium "grabs" the oxygen atom in the water molecule so it can make zirconium oxide, that releases the hydrogen atoms. The free hydrogen builds up until it gets to explosive levels. I have a few ideas. For starters, lets see what happens when fuel rods melt/burn and land in water. So, is the cesium inside the fuel rods a reactive form? If so, certainly there could be some added energy from the cesium (and other elements) reacting with water, especially if the whole thing is pushed by a hydrogen explosion just to get things exciting. It doesn't seem to be something that a lot of experimenting has been done on. Melting nuclear fuel and water. It certainly seems exciting enough. Actually, there has been quite a bit of experimentation of molten fuel falling into water. Shortly after graduating, he visited those of us still in school with some interesting videos of experiments done at Sandia. When molten fuel is dumped in water, the hot fuel is vapor-blanketed with steam which lowers the heat transfer. The movies showed the hot fuel by their own glow. When the mass of fuel first hits the bottom of the vessel, the pressure shock reflects from the bottom upwards and collapses the vapor blanket. That leads to markedly increased heat transfer from the fuel to the water. I remember when the shock collapses the vapor blankets. The image suddenly goes dark because the increased heat transfer drops the temperature of the fuel so it no longer glows. Sandia has done quite a bit of experimentation on melt-down scenarios and such. As I recall, Sandia had a very large program looking at accident containment. Thanks. The interesting things one can learn. I love the internet. Do you know if the cesium inside the fuel rods is reactive? So does any theory go here? I dont want to get scolded. The huge forum has touched on lots of possibilities. and linked to it here at PF. I know of one person who read it. I am hesitant to speculate. But unlike Arnie i give references to back my speculation. my premise is core dried out and control rods melted, so when they got water back up into core it briefly returned to power. not prompt critical, not ejecting any fuel, just a simple power excursion from a plain old delayed thermal criticality. ".... it is possible theyll figure out that there was "Burp" or water hammer in there that quickly immersed the reactor core and made that column of black smoke we all saw on TV. We'll know when they uncover above the reactor - is the head still on it? " a modest excursion as predicted by SARA need not eject reactor internals or fuel. The separator-dryers are designed to let through a lot of steam and their normal function is to act as a collander straining the steam on its way out without causing much pressure drop..
maybe some of you guys will find one of my my references useful for your own theories. I am convinced TPTB are censoring photographs. I urge you to provide references for each step of your logic. I found doing so forced me to keep my thinking in realm of reality. And that's just good technical writing practice. And ,, if you do read that first link, dont skip over that BORAX anecdote - it may be the best part! - By the time the explosion happened, the core had melted significantly. TEPCO had vented from the RPV into containment to reduce pressure - there could have been a great deal of hydrogen from cladding and fuel oxidation which generated more hydrogen than radiolysis in the SFP. - In the case of an explosion of the reactor RPV itself, neither the concrete plug nor the hemispherical RPV cap appears to have shot through the roof. As noted above, the beams above the location of the reactor are still intact (though badly mangled like the rest of the roof structure). - The upper stories of the building are more or less gone, and the roof collapsed onto what remains of the reactor. It appears that the present location of the roof beams is below the initial location of the concrete plug at the top of the containment, strongly suggesting major damage to at least the top portion of the reactor structure. It's just not there any more. - Even in the case of an RPV or containment explosion, it is not inconceivable that the spent fuel pool survived with its load of spent fuel and even still holds water. The most vulnerable part of the pool would be the "cattle chute" and steel doors with inflated rubber seals connecting it to the reactor during defueling/refueling. - I can find no close up photos of the top of the interior of Unit 3. If they want us to believe that the reactor containment is mostly intact, why doesn't TEPCO release photos or video? They must exist - they must have been taken by cameras mounted on the end of the Putzmeister spraying arm, as was the video of the pool Why not show us the state of the rest of the reactor? The world has a right to know in the wake of an INES level 7 incident whether there was plutonium released in the explosion plume. So, is the cesium inside the fuel rods a reactive form? No, we have been through that. It is in the form of ions built into uranium oxide crystal lattice. ..... As noted above, the beams above the location of the reactor are still intact (though badly mangled like the rest of the roof structure). OK, help me on this guys. I have see others say the Reactor is not there any more. Now, as best I can tell from the diagrams, the cement cap it about equal with the top of the SFP. I see nothing from an horizontal perspective to make me think the Reactor or even part of it is gone. I don't know about the cement cap/plug as I can not see that surface area clearly. I know the SFP is there because of the video of the inside of it where I thought I saw the rectangular pattern of the top of the fuel modules. My initial contention that the LARGE explosion could NOT have come from the SFP is based upon seeing that rectangular pattern below all the debris. As far as I know the reactor is still there, but some of the cement above it could be damaged, in fact I think that is what constitutes a lot of the debris in the immediate area. In looking at the video of the Explosion of Three, it does look to me like there were two different explosions that occurred microseconds apart. The first was horizontal and blew out the sides of the top of the building (The area of the building that was not built as containment.) The second explosion appeared to go straight up and seemed to have multiple magnitudes of force compared to the first explosion. I think everybody sees the first explosion as hydrogen, just like Reactor One, but the second explosion appears to have been focused UP. Was it two different pools of hydrogen or was the second explosion something else? Could the second explosion have been vectored up from the Wet Well? 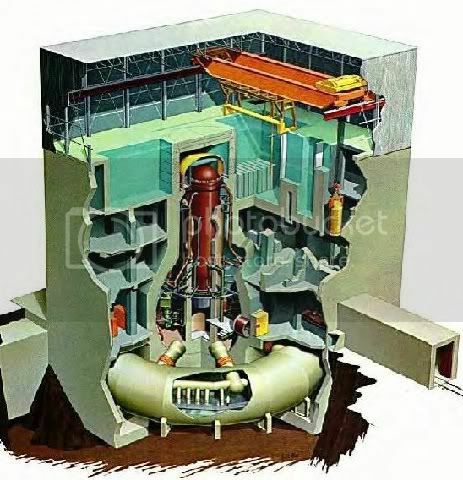 It would have had to have taken the path of least resistance between the floors of the building between the outer wall and the reinforced containment in close proximity to the reactor. In the diagram, just about where the cut away of the torus is.